We've tried to make our website easy to use. Browse through the categories either by type of part or by your bike model to view what is available, or use our search box for specific items. When you find what you require simply add it to your basket and either continue shopping or proceed to checkout. You can manage your account online and make any alterations prior to purchase. How does the basket work? The basket is very much like a real shopping basket. Find the products you'd like to buy and place them in your basket before going to the checkout. You can amend quantities or even delete items as required before payment. Is it safe to shop online at www.yambits.com? Yes! All our payment processing is handled by either PayPal or Sage Pay. We never see your card details and all card details are processed on the handlers secure site only. Yes as this will keep your online shopping safe and secure. You will have to log in when submitting payment or personal details. Your username is your email address – Please spell it carefully when creating an account! As the website is secure, we do not know your password. If you should forget your password just click the 'Password Forgotten?' link on the My Account page. Follow the instructions and a new password will be emailed to you. We suggest you then sign in and change the password to something memorable. We only accept a Credit/Debit card or Paypal. Please ensure you click "Confirm Order" when you are returned to the site from Paypal or Sagepay or you order will not be completed. Sorry, but we do not accept payments via Iban as the UK currency is £ Sterling not Euros and we are charged a conversion fee by our bank. We do not accept cheques or postal orders either due to the high bank charges for processing them. I want to pay in Dollars, how can I do this? If you are paying via PayPal and your account is in dollars once you are transferred to PayPal the total in dollars will be shown, there is no currency conversion charge. Can I pay for my order by telephone? In order to keep costs low unfortunately we no longer take telephone orders. You're welcome to email in with enquiries about parts though. We only accept orders placed on our website. How can I check the shipping charges on an order before confirming to buy? Just add the items to your shopping cart and check the quantities are correct. You can then view the cost of shipping to your delivery address and either complete the purchase or remove items if you wish. There is no obligation to complete the purchase at this point. I am at work during the day, can I have my order sent to a friends or my work? Yes, when you create your account your main account address should be your home address but you can add a number of alternate delivery addresses. At the checkout you can choose the delivery address you wish to have the items sent too. I have just completed payment for an order, can I add to it? No sorry. As with all safe online purchasing systems once the buyer completes payment the order is locked and cannot be changed or added to. If you want other items you would need to create another order. I have paid for an order, can you hold it and post it at a later date? Once an order has been completed, we cannot hold it and post it at a later date. We aim to get all orders to the customer as soon as possible, and this is our policy for every order. I live outside of the E.U. (European Union) do I have to pay VAT (Sales Tax)? No, once you create an account the system only applies VAT/Sales Tax to orders shipped to addresses in the E.U. I bought an item in error, can I return it for an exchange or a refund? Yes we offer a refund policy. To save complications with exchanges we refund you for the returned item allowing you to buy the correct item. We can only refund the value of the goods not the shipping. One of the items is not what I ordered or it is damaged, what do I do? Either return the item or contact us via email or telephone. If the error is ours we will of course reimburse any extra shipping costs you have incurred. Can I order all of the products you sell for delivery overseas? No. Some items are not available to ship overseas due to postal/courier restrictions. There will be an advisory note on the description of the item if this is applicable. Do you stock all the items that are available online? We try to stock as much of our items as possible, but due to the extreme turnover from different internet sources sometimes there may be a delay of a day or two to replenish popular items. Will your parts fit my bike? Unless otherwise stated in the item description on our listings all of our parts are suitable for UK and some European Models only. If you are unsure as to which market your model comes from then please submit your engine/frame number into our Bike Indentifier for further information. I'm not sure what year my bike is. 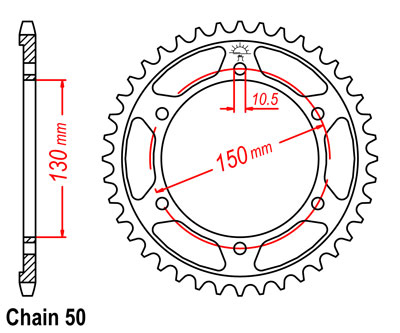 Many parts seem to vary according to the year, how do I know the correct year for my bike? The only safe way is to send us the frame and engine numbers of the bike, you can do this online using our Bike Indentifier service. These numbers must be from the bike and not paperwork as this is often incorrect. Are all your parts genuine? No. We try to offer the best value for money parts, some are genuine, some from OEM suppliers and some we have specially made as they are discontinued by the original manufacturer. How do I contact Yambits? You can email us at sales@yambits.co.uk or contact us. Ordered for a 1983 Yamaha XJ. Arrived within 24hrs. Fast & e .. There are 57 customers online.